Structures of the kidney. Image courtesy of en.wikipedia.org/wiki/File:KidneyStructures_PioM.svg under the terms of the GNU Free Documentation License. The human kidneys are paired, bean-shaped organs that lie against the posterior abdominal wall on each side of the vertebral column. Each kidney has a convex lateral surface and a concave medial surface; each measures about 12cm long, 5cm wide,2.5cm thick and weighs 125-170g in adult male and 115-155g in adult females. The left kidney lies slightly above the right kidney. The renal medulla is subdivided to renal pyramids, and the tip of each pyramid is called renal papilla. Pores on each papilla are the openings of collecting ducts. Hilum, a slit in the concave medial surface of kidney serves as the port of entry for blood vessels, renal nerves, lymphatic vessels and ureter. The hilum opens into renal sinus which includes renal pelvis and its extensions, the major and minor calyces. The kidneys have a rich blood supply. 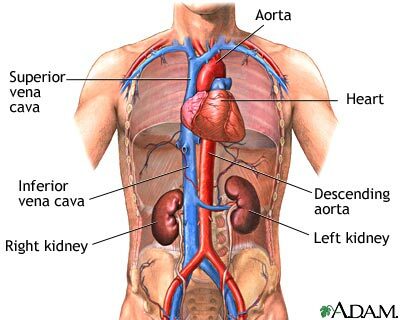 Each kidney receives blood from the aorta via the renal arteries, (which divides and into interlobar arteries) and return blood to the inferior vena cava via the renal veins. The following movie shows an animated representation of the anatomy of a kidney.